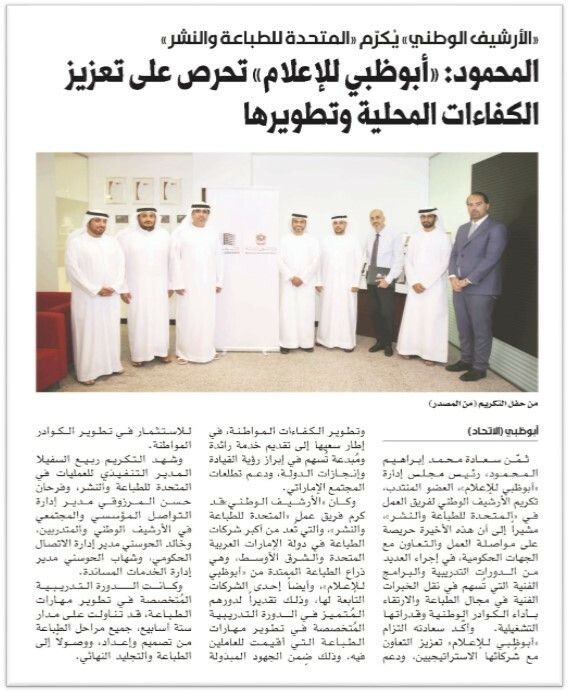 We are pleased to share the press release which was published today in Ittihad newspaper, which is about “honoring United Print and Publishing by the National Archive” In recognition of the company outstanding role in the training and development of trainees from the National Archives. “We thank our team at United Printing and Publishing for their outstanding performance and efforts to provide the necessary support to the trained staff from National Archives, which leaded to enhance and develop cooperation between the two parties". Proudly again, UPP WON the Wan Ifra Asia & ME Award for the Best Printing Services in 2016. The Award Ceremony and conference was held Yesterday 22 Sep 2016 in Kolkata – India. We offer this success to UPP team and Clients. The UAE flag was hoisted at United Printing and Publishing as a way to express love to the homeland and loyalty to the wise leadership. The national occasion of UAE Flag Day is a moment of pride and joy for everyone as they raise the flag today to show their appreciation for the UAE. UPP T/10 Cricket Tournament, organized by United Printing & Publishing, United Security Printing and TAWZEA Abu Dhabi.